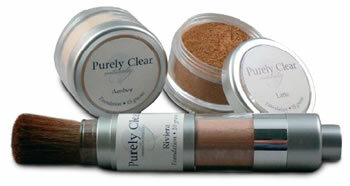 Purely Clear Natural Mineral Makeup is sbest applied with our Powder or Kabuki Brush and should be used sparingly. A small amount swirled into the brush and tapping off excess before application should be sufficient. Foundation sitting in the fine facial lines is a sure sign of over applying. Allow any moisturizer to dry before applying the loose mineral foundation or it could result in a streaky or cakey look. If heavy or dark coverage is desired, applying with a damp sponge will help you achieve the best results. If you prefer liquid makeup, blend mineral foundation with water or moisturizer to desired consistency and apply to dry face with Camouflage Deluxe Foundation Brush. The loose mineral foundation can also be used as a concealer when used wet and applied with our Concealer Duo Brush. All foundations with the exception of Natural color have the following ingredients: Titanium Dioxide, Iron Oxide, Mica, Zinc Oxide, Green Tea Extract, Resveratrol, Indian Frankincense.